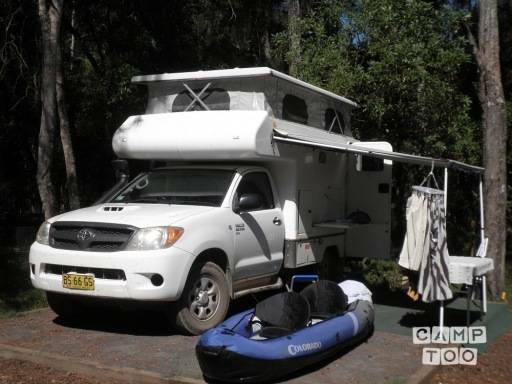 This is a fully equipped and compact 4WD camper in great condition. It is excellent for long drives and has a great fuel economy. The cabin is neat and comfy, great for weekends or for a few weeks on the road. The inside is spacious, comfy and has been set up professionally. There is a king size bed, fridge, sink, radio, couch and table. There is also an outside cooker and prep bench for the alfresco experience, just roll out the awning to have some shade while relaxing outside. The perks of this camper is that the set up is a breeze - just pop the top up and your camping experience can begin! No annoying ropes and poles and its safe and secure with a lockable door. Best car hire ever! Thanks Dave for the use of Super Trooper and super service. Will book in for our next trip. Je kan de camper ophalen in Woollahra bij David. Je kan je auto hier gratis parkeren.